People who have diabetes need to be more careful with alcohol. Before you drink, consider a few things: Is your diabetes well controlled? Do you know how drinking alcohol can affect you? Do you have high blood pressure, nerve damage, or eye problems from your diabetes? If you take insulin or another medicine for diabetes, drinking alcohol may cause low blood sugar. This could cause dangerous low blood sugar levels. Too much alcohol can also affect your ability to know your blood sugar is low and to treat it. Drinking alcohol can make you light-headed at first and drowsy as you drink more, both of which may be similar to the symptoms of low blood sugar. Drinking a lot of alcohol over a long period of time can damage your liver (cirrhosis). If this happens, your body may lose its natural response to protect itself from low blood sugar. If you are controlling your diabetes and do not have other health issues, it may be okay to have a drink once in a while. Learning how alcohol affects your body can help you make the right choices. Work with your doctor or other diabetes expert to find what is best for you. Make sure you know whether it is safe to drink if you are taking insulin or another medicine for diabetes. Choose alcoholic drinks wisely. With hard alcohol, use sugar-free mixers, such as diet tonic, water, or club soda. 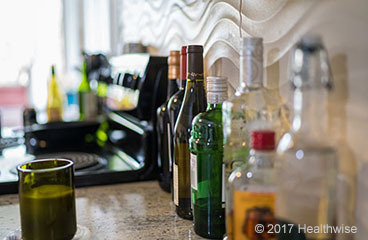 Pick drinks that have less alcohol, including light beer or dry wine. Or add club soda to wine to dilute it. Also remember that most alcoholic drinks have a lot of calories. When you drink, check your blood sugar before you go to bed. Have a snack before bed so your blood sugar does not drop while you sleep. Do not drink alcohol if you have problems recognizing the signs of low blood sugar until they become severe. Do not drink alcohol after you exercise. The exercise itself lowers blood sugar. Do not drink if you have nerve damage. Drinking can make it worse and increase the pain, numbness, and other symptoms. Do not drink if you have high blood pressure. Do not drink if you have diabetic eye disease. Do not drink if you have high triglycerides, a type of fat in your blood. Drinking can raise triglycerides. Do not drink if you are trying to lose weight. Alcohol provides empty calories that do not give you any nutrients. Do not drink and drive. The effects of alcohol are greater if you have low blood sugar. You are confused or cannot think clearly. Your blood sugar is very high or very low. Your blood sugar stays outside the level your doctor set for you. Enter T236 in the search box to learn more about "Diabetes and Alcohol: Care Instructions".